Reckoning (or more formally titled: Kingdoms of Amalur: Reckoning) is the first title by Curt Schilling's 38 Studios. Created by the team at Big Huge Games (a studio of 38 Studios that is located in Baltimore, Maryland and famous for making Rise of Nations) Reckoning is a single player fantasy RPG. The main story line is about 50 hours and there are 200-300 additional hours of side-questing that can be completed. 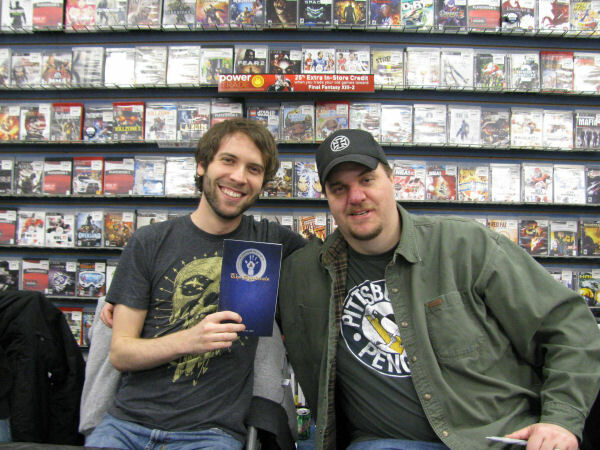 As Curt announced back at PAX East in 2010, he reached out to The Syndicate some time back to partner with us in aiding his development process. Specific to Reckoning, The Syndicate sent numerous consulting teams to BHG to play Reckoning throughout its development. Those sessions had both active and passive impacts on the game. From a passive side, as the developers watched the team play through the game at such an early state, much was learned about how things flow and what players would see and wouldn't see so many changes came to pass because of that. From an active standpoint, meetings were held to elicit changes that the teams felt needed to be made to make the game a success. Many ideas were generated and a huge number of them are evident in the final release. The team at BHG was incredibly fun to work with. They take their work seriously but are very open to the desires of the players and are dedicated to making a first class product. The Syndicate was proud to be part of the process and excited to see how much of a success the launch of Reckoning was. We are now actively engaged in the development of Project Copernicus (the MMO based in the same world of Amalur occuring in the distant future from the events that play out in Reckoning). A side story is told by squad leader Stymie and takes place the night of the Reckoning launch. Stymie was one member of the on-site consulting team that worked with BHG/38. 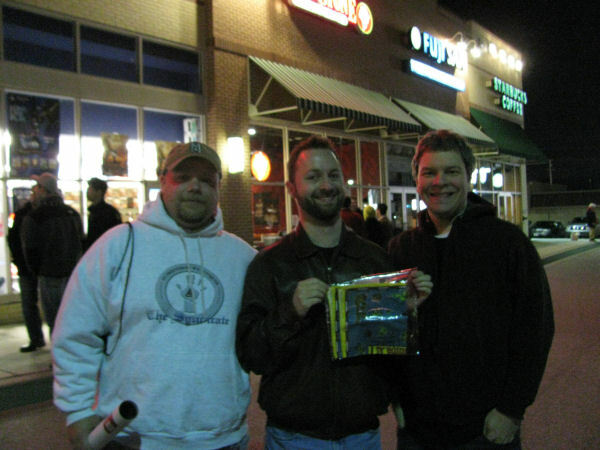 He shares this tale and pics of the launch party near the BHG offices north of Baltimore, MD: When arriving at the local Gamestop, I parked the truck and didn't see anyone in line at the store. As soon as I got out, I noticed a huge crowd gathered out in the parking lot. 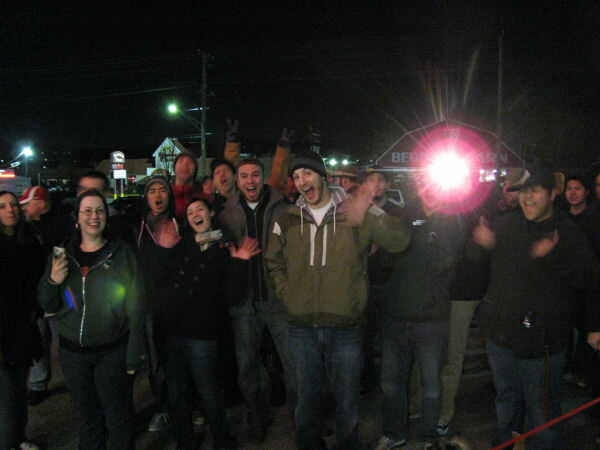 This was over 70 members of the Dev Team along with people who have come to get the game having a Tailgate Party. Burgers, Hotdogs, and sandwiches were being offered to anyone who showed up to help them Celebrate Kingdom of Amalur-Reckoning going on sale. Why were they so excited ? It was the first product to come out from the 38 Studio's Camp and marked the entry of a new IP to the gaming scene. In talking with many of the Developer's, I learned that for most, this was either their first game they worked on or their first major game project. The air was electric as the stroke of midnight approached. 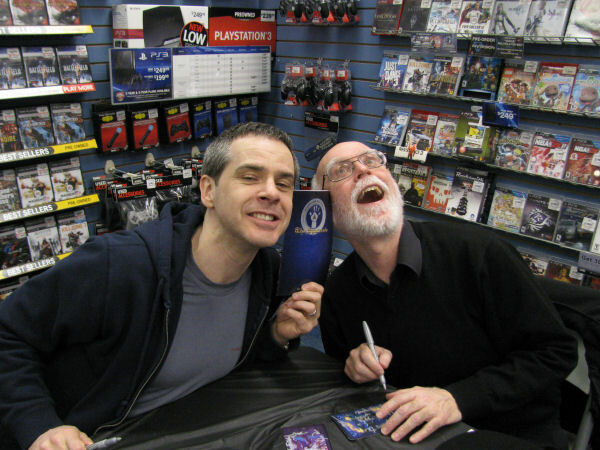 After saying hello to a few people, I entered the Gamestop and pre-purchased my copy and there I met the Game Designer himself, Ken Rolston. We chatted for a while about the game and how excited he was for his latest work. The one thing I found funny was he really had wished he had brought his wife to see what a big deal he and his game was on this night. He was in fact one of the night's Rock Star's. We parted ways so he could make the rounds and I headed back outside to meet more of the Dev Team. The Games Producer noticed my Syndicate Jacket and came right up to me and introduced himself. For the next 30 minutes or more, we talked deeply about the game and what it took to bring it to the Shelf. We discussed the false rumor of Diablo 3 being released the same day as Reckoning and how it affected the Studio. Basically, they were ready to postpone the Release if the rumor was true. In fact they called Blizzard directly and asked them to confirm the rumor. Once Blizzard had deflated the rumor, a huge sigh of relief was heard and work continued toward release. In fact, the Dev Team had dealt with this once already with Skyrimm. That game being released did actually postpone Reckoning's release, but according to the Producer, it was welcomed as it gave them 3 more months to test and polish their game. We talked about whether they would release a Booster Pack style expansion for the game. He said that they had no plans to do that, but were really looking forward to doing a sequel. He said that 1.5 million sales would guarantee that would happen. And with Copernicus about 2 years out, they could turn a sequel out in 12-18 months. But the one thing that made me smile the most from our Conversation was that he confirmed to me that the Syndicate was honored in the Credits of the Game. The midnight hour had crept even closer and he excused himself to attend to some last minute items. I made my way around introducing myself the more Team Members and everyone was so courteous and thankful that the Syndicate had taken part in helping them make a better game. I met Ian, one of the Headliner's on the Dev Team. I had met him during my trips to the Studio as part of some of The Syndicate's consulting teams. There, he showed me his office and it's walls were covered with Ultima Cloth Maps. With this in mind, I presented him a gift from the Guild as a Thank You for letting us lend a hand to their project. 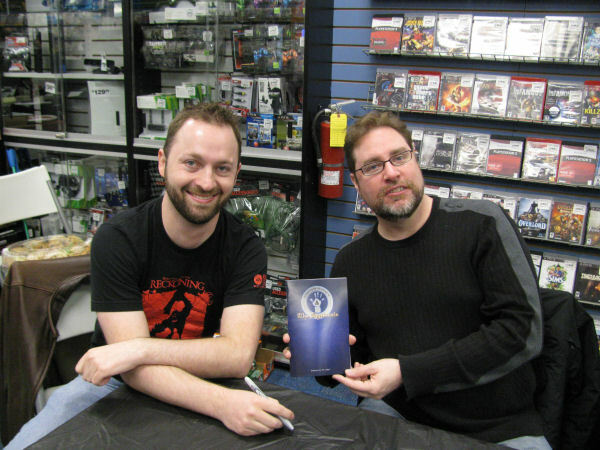 I handed him an Ultima VI cloth map autographed by Lord British himself. He was absolutely floored by the gift. He went around the rest of the night showing it off to people. Before we knew it, people were holding up their Smart Phones all reading 12:00. It was time for the Game to officially go on Sale. 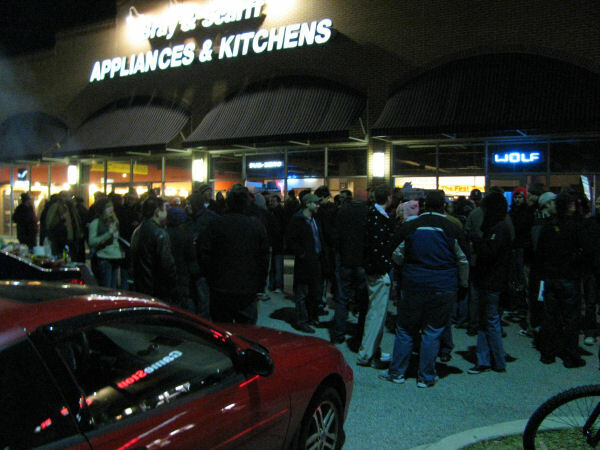 A line formed outside of the GameStop for everyone to pick up their Copy of game and get it signed by the major Dev Team members. The over 60+ members all stood outside. The first person exited the store copy in hand and loud cheering and cow bell's broke into Celebration. And this happened as each customer left the store. There was no doubt that the Dev Team Members were excited that the day had finally come at last. I joined the line myself towards the back as I had additional stuff I needed signed for this years Syndcon Charity Raffle and didn't want to hold up the other customer's. In fact I had been offered to have all of my stuff autographed before anyone else entered the Store, but turned them down. As a Syndicate member, we get a lot of access to things most people will never get. I didn't need to wave that in anyone's face and did not need preferential treatment. I could wait like everyone else. I was one of the last of about 50 or so people who bought the game that night. Inside, the long table was set up and the major members of the Dev Team were there to sign anything you put in front of them. The items I brought dumbfounded them. Where did you get that ? Wow...I never seen that before. How did yo get those ? They were as excited to see what I brought as much as being able to sign the items. All business taken care of, I had one last piece of business. I reached into the Guild backpack and retrieved a Blue Book. And I had the Dev Team take pictures holding it for me. They all just thought that was a Hoot...especially Ken Rolston.